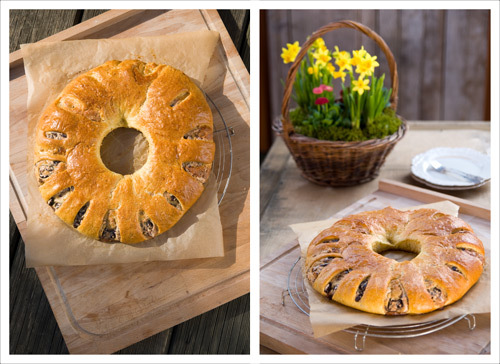 This month the Daring Baker's chose a yeasted coffee cake, formed into a wreath as their challenge. 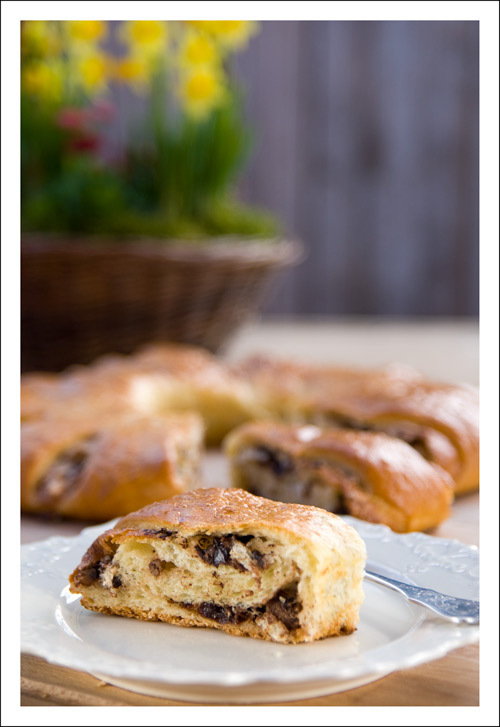 It's a little early, but this would make the perfect bread for your Easter brunch. The special thing about this recipe is the addition of a meringue layer in the filling. The dough was very easy to work with. I chose to use fresh yeast, instead of dry, and it was a really smooth dough. For the filling I used a combination of dark chocolate, dried cherries and pecan nuts. The bread was moist and very yummy. A trick to get an even round shape in the middle is to bake the cake around an upside-down turned ramekin (or any round ovenproof bowl). Be sure to brush the bowl with a little oil, which makes it easier to remove it after baking. In a large mixing bowl, combine half of the flour, the sugar and salt. Sprinkle the yeast in the center of the flour. In a saucepan, combine the milk, water and butter and heat over medium heat until warm and the butter is just melted. Gradually add approximately a quarter of the warm liquid in the middle of the flour/yeast mixture. Put a dish towel over the bowl and let sit for about 15 minutes at a warm place. Add the remaining liquid and with a mixer beat until well blended. Increase mixer speed to medium and beat 2 minutes. Add the eggs and the remaining flour and beat for 2 more minutes, until the dough comes together. Place the dough in a lightly greased (I use vegetable oil) bowl, turning to coat all sides. Cover the bowl with a kitchen towel and let rise at a warm place until double in bulk, 45 – 60 minutes. The rising time will depend on the type of yeast you use. In a small bowl, combine the cinnamon and sugar for the filling if using. You can add the chopped nuts to this if you like, but I find it easier to sprinkle on both the nuts and the chocolate separately. In a clean mixing bowl – ideally a plastic or metal bowl so the egg whites adhere to the side (they slip on glass) and you don’t end up with liquid remaining in the bottom – beat the egg whites with the salt, first on low speed for 30 seconds, then increase to high and continue beating until foamy and opaque. Add the vanilla then start adding the ½ cup sugar, a tablespoon at a time as you beat, until very stiff, glossy peaks form. On a lightly floured surface, knead the dough and then roll it out into a 20 x 10-inch (about 51 x 25 ½ cm) rectangle. Spread the meringue evenly over the rectangle up to about 1/2-inch (3/4 cm) from the edges. Sprinkle your filling of choice evenly over the meringue. Now, roll up the dough jellyroll style, from the long side. Pinch the seam closed to seal. Very carefully transfer the filled log to one of the lined cookie sheets, seam side down. Bring the ends of the log around and seal the ends together, forming a ring, tucking one end into the other and pinching to seal. Using kitchen scissors or a sharp knife (although scissors are easier), make cuts along the outside edge at 1-inch (2 ½ cm) intervals. Make them as shallow or as deep as desired but don’t be afraid to cut deep into the ring. Cover the coffee cake with a kitchen towel and allow it to rise again for 45 to 60 minutes. Preheat the oven to 180°C (350°F). Brush the tops of the coffee cake with the egg wash. Bake in the preheated oven for 25 to 30 minutes until risen and golden brown. The dough should sound hollow when tapped. Remove from the oven and slide the parchment paper off the cookie sheet onto the table. Very gently loosen the coffee cake from the paper with a large spatula and carefully slide the cake off onto a cooling rack. Allow to cool. These are best eaten fresh, the same day or the next day. Hello, I am Sabine, welcome to my Blog! On these pages I would like to share my food photography and my passion for baking and dessert making. All images and content of this site are copyright of Sabine Ketzler-Chan, and may not to be used without permission. All rights reserved.